Well known fake/satirical website The Last Line of Defense posted two articles today titled "BREAKING: Hillary Clinton Has Third Heart Attack-Docs Says She 'Won't Survive'" and "BREAKING: Hillary Clinton Suffers Heart Attack While Standing In Line At Her Favorite Store". 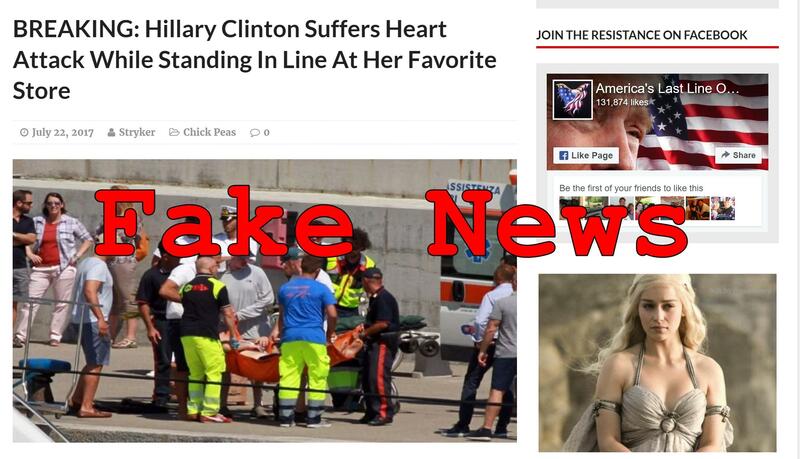 UPDATE: As American As Apple Pie, another fake/satire website using the same Google Analytics tag as The Resistance The Last Line of Defense also posted a similar article titled "BREAKING: Hillary Clinton Has Second Heart Attack While Being Released From The ER". Hillary Clinton was standing in line at Whole Foods waiting for a mango and beet root smoothie when she suffered what her doctor is calling a "minor cardiac event." Bystanders in the area gave her aspirin off the shelf and an asparagus water to wash them down, which EMT Roger Niederfeld says may have saved her life. Hillary Clinton had a third and most-likely fatal heart attack this afternoon after spending the morning being told she'd be getting better. It almost seems fitting that the last thing she hears is a lie about her own well-being. Obviously both stories are fake as no other media are reporting about the event at all. Funnily enough the picture used with one of the stories is clearly not from anywhere near a Whole Foods store: why would the ambulance markings be in Italian in that case? There are no Whole Foods branches in Italy, we checked. In fact the picture is from a story published two days ago: the chef on Tiffany Trump and Marla Maples vacation yacht was taken ill and had to be evacuated by ambulance in Elba. Unlike some of the earlier hoaxes of The Last Line of Defense, this one seems to have been only a moderatel succes so far as the Trendolizer graph at the end of this article indicates. If you notice anyone spreading the rumor around you can help by pointing them to this article here because nobody likes fake news.